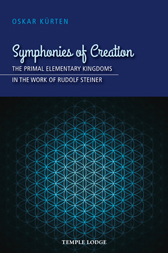 A hidden gem for students of Rudolf Steiner’s spiritual-scientific research, Symphonies of Creation offers a breathtaking overview of the physical and metaphysical development of the world and humanity. In describing the elementary kingdoms, Kürten elucidates the exalted spiritual realms out of which all creation has arisen. These are the formative forces that provide successive life-waves of being with the subtle and physical forms through which their evolution becomes possible. He traces the beginnings of creation – an unformed ‘thought seed’ in the elementary kingdoms that is elaborated by hierarchical beings at all levels, through the planes of the spiritual, soul and physical worlds – to the manifold and evolving aspects of the human being. What emerges is a picture of astonishing complexity and beauty in which all spiritual beings connected with the earth, from the highest to the lowest, work together in symphonic harmony. Rudolf Steiner spoke on many occasions and in different places of these elementary kingdoms and the multiple processes that take place within them. Kürten has sought out these references, meditated on their content and re-presents it here in an inwardly coherent synthesis. Even for those who have been studying anthroposophy for decades, this book can offer startlingly fresh insights. Symphonies of Creation is the life’s work of a man who, due to severe deafness, led a retiring existence. His inner work, however, was full of life – the results of which are presented in this inspiring study. OSKAR LAMBERT KÜRTEN PhD was born in Anleur, Belgium, in 1886. He lost his hearing during his student years, becoming almost completely deaf. Despite this, he held a senior position in the Berlin State Statistical Office for over 50 years. Kürten developed an interest in spiritual world-views and had an inner experience that anthroposophy was his personal path. He lived for and out of anthroposophy, especially Rudolf Steiner’s Christ impulse, publishing three books on the theme. He died in Berlin in 1973.